Arcadia Publishing (SC), 9780738515502, 128pp. In a state famous for secession and Old South ideals, Greenville stands as one of South Carolina's most precocious and complex communities. Settled in the inviting shadows of Paris Mountain along the Reedy River, both city and county struggle between the traditional values of a distinct Southern heritage and the progressive trends of a growing and diverse population. Throughout the mid-1800s to the late 1960s, Greenville embraced, even thrived, on this conflict, turning tension into opportunity and creating a remarkable society of savvy entrepreneurs, enlightened educators, talented writers, and triumphant athletes. 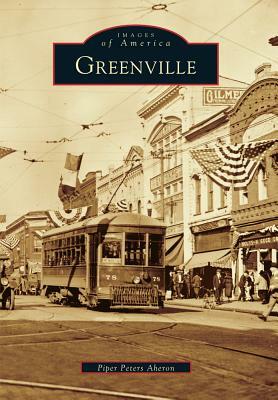 In this volume of over 200 seldom-seen images, Greenville offers a fascinating glimpse at the people, the schools, and the businesses that dramatically transformed a Tory plantation into a sprawling metropolis. From the rustic portraits of mineral springs and mansion resorts to the snapshots of fast trolleys and overcrowded cantonments, this book highlights a special place that was home to Shoeless Joe Jackson and Jesse Jackson and played host to global notables, such as Albert Einstein and Ronald Reagan.